Misaligned companies, like cars out of alignment, can develop serious problems if not corrected quickly. They are hard to steer and don't respond well to changes in direction. This groundbreaking book shows you how to get -and keep -all the vital elements of your organization aligned and headed in the same direction at the same time. Managers must now keep their people centered in the midst of change, deemphasize hierarchy, and distribute leadership by distributing authority, information, knowledge, and customer data throughout their organization. Alignment is a response to the new business reality where customer requirements are in flux, where competitive forces are turbulent, and where the bond of loyalty between an organization and its people has been weakened. The old linear approach to management has given way to one of simultaneity -to alignment. 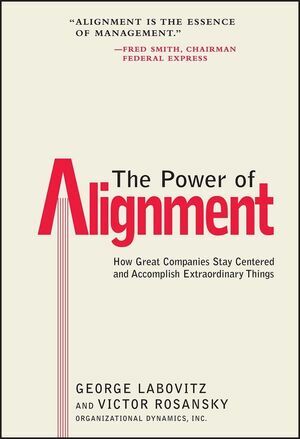 As pioneers of the alignment concept, the authors have developed this unique approach based on their work with leading companies throughout the world. The Power of Alignment is packed with war stories and the firsthand perspectives of industry leaders. You'll learn how world-class organizations, including Federal Express, the Jet Propulsion Laboratory, Columbia/HCA Healthcare, Citizens Utilities, AirTouch, and UNUM achieved extraordinary business results. Now, through the authors' expertise, you'll see how alignment can work for your organization. * Helps a company determine when and where it is out of alignment, and gives descriptions of such common company pathologies as "The Phantom Limb Syndrome," "Strategy Interruptus," and "Dead Man Walking"
Essential reading for all managers and executives, The Power of Alignment offers a new way to reestablish focus and sustained energy, and is a dynamic approach for staying balanced and achieving extraordinary levels of performance. "It's not only the stars that have to be in alignment to reach your destination, it's all the internal processes, rewards, and drivers. Read The Power of Alignment, and while you may not unlock the secrets of the universe, you will overcome the barriers to corporate success." - William L. Boyan President and COO John Hancock Mutual Life Insurance Company. "This important book goes beyond TQM and reengineering by creating a new approach called Alignment. The authors show that great companies manage to link strategy and people and integrate customer needs with continuous improvement processes." - Peter Augustsson President and Group Chief Executive AB SKF. "The Power of Alignment gets to the heart of a critical element of organizational leadership, namely focus. Every leader who reads it will undoubtedly do some serious soul-searching about the consistency of corporate vision, goals, management systems, and incentive mechanisms." - Louis E. Lataif Dean Boston University School of Management. GEORGE LABOVITZ, PhD, is the Chairman of Organizational Dynamics, Inc., a Boston-based international consultancy, which has been named one of the top quality consultancies in the world by both BusinessWeek and IndustryWeek. Dr. Labovitz is also a professor of management at Boston University's School of Management. Coauthor (with Victor Rosansky) of Making Quality Work (Wiley), he has also published articles in Fortune, the Wall Street Journal, Quality Progress, and Quality Digest. VICTOR ROSANSKY is Organizational Dynamics's Executive Vice President and coauthor of Making Quality Work. In constant demand as a speaker and consultant, Mr. Rosansky has advised organizations throughout the United States, Asia, and Europe. Getting to the Main Thing. Staying Centered: What Alignment Is All About. Aligning Activities with Intentions: Vertical Alignment. Ships Passing in the Night: Getting to Horizontal Alignment.